Experience the theme park where fun runs wild. 1,300+ animals. 60 botanical acres. 1 wild time. Explore life under the sea. No deep wallet diving required. Meet Winter - the star of "Dolphin Tale" and "Dolphin Tale 2"
You can’t help but channel your inner Tarzan. Tampa is a great family destination. There are plenty of attractions for kids (and adults!) like Busch Gardens, Adventure Island, The Florida Aquarium, Tampa's Lowry Park Zoo, and more. Besides the attractions, there are lots of natural parks and preserves to explore to get a glimpse at Florida’s wildlife. Tripster Tampa coming soon! Select Attraction Adventure Island Tampa Andretti Indoor Karting & Games Aquatica - SeaWorld's Waterpark Boggy Creek Airboat Rides Busch Gardens Tampa Chocolate Kingdom Factory Adventure Tour Clearwater Marine Aquarium Crayola Experience Dinosaur World Florida Discovery Cove Orlando Disney World® Theme Parks Escapology Everglades Tour Exploration Tower at Port Canaveral Explorations V Children's Museum Florida Adventure Tour Fun Spot America Theme Parks Gatorland Gatorland Night Shine Tour Gatorland's Screamin' Gator Zip line with Free Gatorland Park Admission GatorWorld Parks of Florida Go Orlando® Multi-Attraction Card Horse Riding Orlando I-Drive NASCAR iFly Orlando Jet Skiing, Kayaks & Stand Up Paddleboard Rentals with Buena Vista Watersports Jungle Adventures Nature Park & Zoo Kennedy Space Center Visitor Complex LEGOLAND Florida Resort Limousine Character Dining Machine Gun America Madame Tussauds Orlando Miami Seaquarium Orlando Balloon Rides Orlando Multi-Attraction Explorer Pass® Orlando Tree Trek Adventure Pirate's Cove Adventure Golf Pontoon Rentals Revolution Off-Road Mucky Duck Revolution Off-Road Target Archery Revolution Off-Road Trophy Bass Fishing Revolution Off-Road-ATV Off Road Experience Ripley's Believe It or Not! Orlando Odditorium SEA LIFE Orlando Aquarium SeaWorld Orlando SKELETONS: Museum of Osteology Suhls Rodeo Tampa Bay / St. Petersburg Speed Boat Adventure Tour Tandem Hang Gliding Flights The Florida Aquarium The Wheel Titanic ~ The Artifact Exhibition TreeUmph! Adventure Course - Bradenton Universal Orlando Resort Waterski, Wakeboard, & Tubing Charters with Buena Vista Watersports Wild Florida Airboats WonderWorks - Orlando Zoo Miami ZooTampa at Lowry Park! 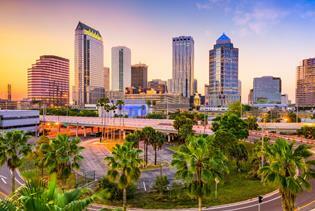 With world class dining and shopping, Tampa is a great destination to experience new food and cultures. Make sure to visit Ybor City, which was created in the late 1800s around the Cuba cigar-rolling industry. It now has a vibrant nightlife with music and dancing. Hyde Park is an upscale shopping and dining district with lots of boutiques. Although there are plenty of things in town to keep you busy, if you decide to head to the beach it’s only 30 minutes away. Take a day and relax on the sand or stop at Clearwater Marine Aquarium. The coast is close enough that you can take a day trip and be back in Tampa for dinner. And there are always free things to do in Tampa as well, so let’s pack and go!